Recipe: Healthy Spring Rice Bowl with Ambrosia. A Fresh Dinner Idea Packed with Nutrition and Taste. Foodies and food journalists agree – it’s ‘bowl-mania’. 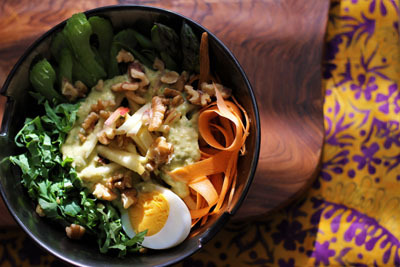 One website even declared 2017 the ‘Year of the Bowl.’ Ambrosia is getting in on the action with this healthy, fresh bowl recipe for spring. In case you don’t have bowl-mania or have any idea what these foodies are talking about, a ‘bowl’ is quite simply a combination of foods served, deconstructed in a bowl. 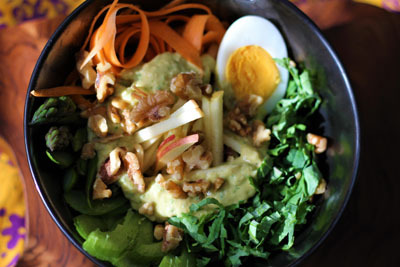 It’s hard to say where it started, but in the past few years the food scene has celebrated Buddha Bowls (usually steamed veggies on rice with some sort of sauce), Hawaiian Bowls (often featuring Poke or raw fish) and Breakfast Bowls (which blend the overnight oats trend with any pretty combination of fruits, nuts and yogurt). The one thing that is constant between them all is that they tend to be healthy. So, a bowl of poutine, for example, wouldn’t really be considered a ‘bowl’. The other requirement is that the presentation needs to be as satisfying as the taste. This trend owes its mania-status to Instagram and Pinterest, so it has to be picture worthy. Usually a top down shot that shows off the variety of ingredients ranging in shapes, textures and colours. We eat with our eyes too, after all. We experimented with a variety of options for our bowl recipe, knowing that we wanted to make the Ambrosia apple the centre piece. What we’ve come up with could, in our humble opinion, win Bowl of the Year (if only such a prize existed). Place 1/2 to 1 cup of cooked brown rice at the bottom of a large bowl. The result is a beautiful, colourful and incredibly healthy dinner that’s fun to eat. Try it and we bet you’ll understand why this whole ‘bowl’ thing is so popular. What would you put in your Ambrosia Bowl? Share your recipe (and pics, of course) with us on Twitter, Facebook, Pinterest or Instagram. Use the hashtag #AmbrosiaAppleBowl. We can’t wait to see what you come up with.